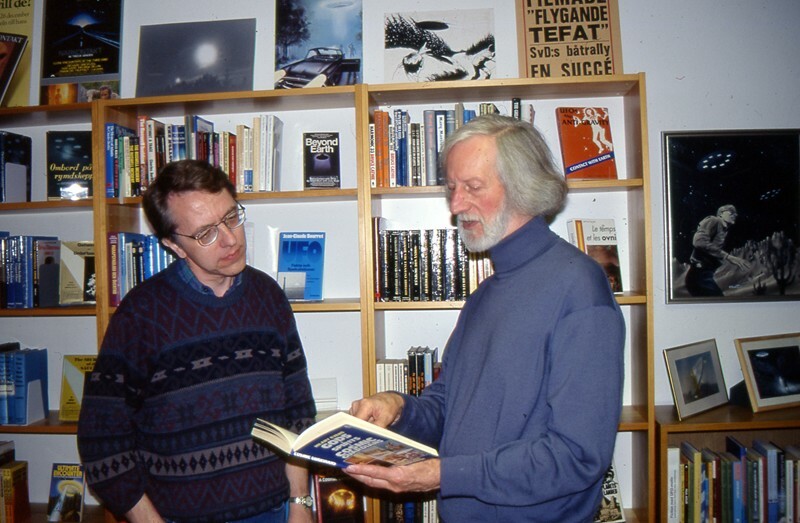 This is the second part of the interview Anders Liljegren and I did with Hilary Evans at AFU on October 7, 1996. In the former blog post I promised that this would be a transcription of the complete interview. What I didn´t realize at that time was that the interview takes more than one and a half hours. This would involve an inordinate amonut of time to transcribe so I decided to select those questions and answers I found most interesting. Håkan Blomqvist (HB): Did you start your own investigations of cases? 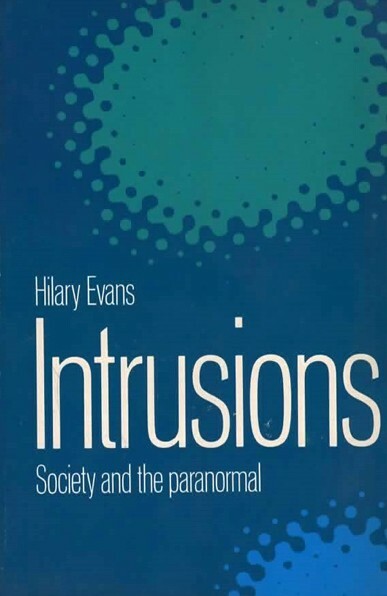 Hilary Evans (HE): I´ve done very little, chiefly as you know yourselves, investigation takes a very great deal of time and if it one thing I do not have it is time. The Picture Library need all the time I can give it. HB: But you have done some field investigation? HE: Well the most interesting for me was going done to West Wales. In 1978-79 there was a big flap in lots of places in West Wales. 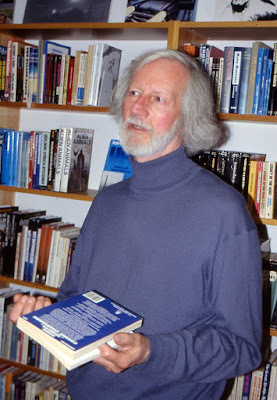 Peter Brookesmith editor of the publication The Unexplained invited me to go down there to investigate. I went and talked to all the people. The very first evening I arrived I drove to the first sight where a school was and the children had seen a UFO outside the school in midday. They went out to play when they saw this flying saucer in a field. And I saw something which was completely unexpected. Behind the school there was indeed a field but it was not a flat field, it was a field surrounded by a valley and on the top of the valley were houses. All around there are houses. There are people in the houses and people look out the window but nobody sees this flying saucer which was there from twelve o´clock to four o´clock. Four hours and nobody saw it. This is not mentioned in the books so right from the beginning I was skeptical. For three days I carried out my investigations, meeting people talking to witnesses. Almost everything I found out was totally negative. There was a farm where very strange things took place and I went along to the farm. Two chief witnesses had gone away by this time, they had left but some lived in a little cottage and those people were still there. I talked to them and nobody had asked them any questions, which is incredible. I was the first person who had asked these people about the strange things that had happened and they said nonsense, absolut rubbish. If you read the book by Pugh and Holiday, (The Dyfed Enigma), you will find out that all the cows were taken up in the air and put down here, which is a marvelous thing if it is true. They were in a farm yard which was locked, there was a fence. The investigator, Pugh, is a veterinary surgeon. If anybody knows about cows it is a veterinary surgeon and he said there is no way the cows could have gone out of there. But they were always getting out. People was always getting telephone calls from the next door farms saying your cows have come here again so come and get them. HB: No one had asked the right questions? HE: They had explanations for all the strange things that had happened to these people. But if you read the Pugh book or the Peter Paget book they all create great mysteries but they all had explanations. Unless you investigate the investigator you will never find this out. Pugh is a vet and you think people in his position are very scientific in their investigations. You expect that from somebody with that qualification. I went to visit him and he was very nice. We spent an afternoon talking and drinking tea, discussing the whole thing. I let him talk and talk and didn´t make any objections. And it was obvious he was mad. He told me that since the investigation he had come to realize that UFOs are crated by the devil. He got all his papers and took them out behind the house and lit a fire. But it wasn´t as simple as that because he made a fire and the smoke comes out and it turns itself into the shape of a devil. Finally there was one case that I thought was very interesting because it was a farmer´s wife and she had seen something in broad daylight. I thought a farmer´s wife is very practical, that´s good, so I phoned her up and said can I come and talk to you. She hesitated a bit and then she said yes, I haven´t thought about it for two years and it would be quite nice to talk to somebody about it again. I went there and she was very nice and she told me a story and it is just her testimony, that is all there is. She seemed to me to be a totally honest peson. She wasn´t trying to sell her story. She said I got up one Saturday morning. It was sunshine, full day and I looked over the field and there was a strange object in the field, on the ground. She said I looked at it for two minutes. It was metal, about 15-20 meters in diameter. She said I must get somebody else and she ran to her son´s bedroom and said you must come and look at this. And typically when they came it was gone. HB: Did she check the ground? HE: Yes, and there was no signs of anything. The only thing to support her story was that in this field she keeps a pony and normally first thing in the morning the pony is here because it want´s it´s breakfast. But this day it was right up in the corner. I think she was telling the truth but to be honest I think she was hallucinating, but I can´t prove it. All I can say that is a genuine story. The only positive story I heard. One person´s testimony doesn´t mean anything scientifically but I was impressed. After that I went back to London and telephoned Peter Brookesmith and I said you´re not going like this I have to say, it was almost entirely negative. At this time I was a still a little bit naive I thought that everybody was to believed and Peter Brookesmith said wonderful, that´s what I want because he said I got so many stories coming in of people who believe and I would love to have something which is skeptical so he printed my article about it. That was when I realized that it is absolutely essential to investigate not only the phenomenon but the people involved. HB: Have you investigated any case where there is not a psychological explanation? HE: If you´re thinking of a physical phenomenon I have been very intersted in the Hessdalen lights. The three cases I find truly conclusive, not conclusive, wrong word, but I think there is no doubt whatsoever that something is taking place are the three cases where the phenomenon has repeated enough that investigation can be carried out, not of the original story but of the phenomenon itself and that have to be cases where the phenomenon is seen over and over again. One of them is Yakima in Washington state. The second is Project Identification, Harvey Routledge and the third one is the Hessdalen lights. Most of the cases are where you only have what the witness tells you and all you can do is test his story. But in Hessdalen you can actually investigate the phenomenon itself. Those are for me the important cases. HB: I read in the Jerome Clark Encyclopedia that he criticize you for the psycho-social theory? HE: He is of course a great enemy of the psycho-social thing but Jerry Clark and I have a very good relationship. He is always criticizing me but he knows now that I don´t mind. Although I say that most of the cases have a psycho-social explanation it doesn´t mean I think there are no UFOs. If by UFO you mean literally an unidentified flying object then yes there are, of course there are. I think there are strange things in the sky which need to be explained and I don´t think a conventional explanation will be enought. It may be purely natural but I am not closing my mind to the possibility of something literally undiscovered by science. HB: How do you regard close observations by several witnesses of purely metallic craft that look like a totally foreign technology? HE: If you have several witnesses there is always a problem. This is the kind of thing that makes me say we are still looking for answers in these kind of cases. If I would say who is the best investigator in the world I would say Richard Haines. I have a very great respect for him. A man of great integrity. When he says something I trust it, I believe it. HB: If you would give an advice to Swedish UFO field investigators what would you say? HE: The first thing you must have is an open mind. I hope I got that. If the evidence was good that there were aliens from other worlds coming I hope I would be able to accept it. If I have a psycho-social bias that is the conclusion I have come is because of how I read the evidence. It seems to me the evidence suggests a psycho-social explanation. But I am not committed to that and you should never be committed you must be open minded. HB: What is your opinion on CSICOP, the skeptics organization? HE: Well, they do some very useful work. I have never met Robert Sheaffer but Philip Klass I know and I like him very much and I think his books are very important. His work is very valuable. What I have against Klass is that he is not open minded. Right from the start he assumes that it´s a fake or a hoax. Most of the time he is right and when it comes to the Travis Walton case I still think it is a hoax, even in spite of everything. I´m open minded but that is my estimate of the case. I would just like Klass to say just once there is a possibility of something else for the Hessdalen lights or Yakima. HB: He sounds more like a dogmatic than an inquisitive scientist? HE. That´s the trouble but I don´t altogether blame him because the circumstances in America is if it´s not black it´s white. He´s being forced by the media. If he´d had a stronger personality he would have been able to be like Jacques Vallee – sometimes yes, sometimes no. Phillip Klass is only a journalist and the media needs a bogey man, a big bad wolf. I said to him I´m sure you enjoy being the big bad wolf and he said yes I love it. He´s playing a part. So even if he has privately in bed at night doubts he would never publish it. His position is to be committed. HB: That is not very scientific? HE: Not at all. But he isn´t a scientist. He´s a journalist. HB: But he is the official spokeman for the organization. HE: This is what I have against CSICOP altogether. I don´t like it. I get the Skeptical Enquirer and often there are very interesting cases but every single article is written from the point of view of someone who knows from the start that it´s not true: spontaneus combustion, the influence of the Moon whatever it is. I know for sure, I have no doubt whatever that the Moon influences behavior. When the Moon is full it will effect peoples behavior. I know it happens to me. I know it happens to our dogs. I´ve seen enough cases. So I know they are wrong. When I find Skeptical Enquirer is wrong on that why can´t they be wrong on other things too. 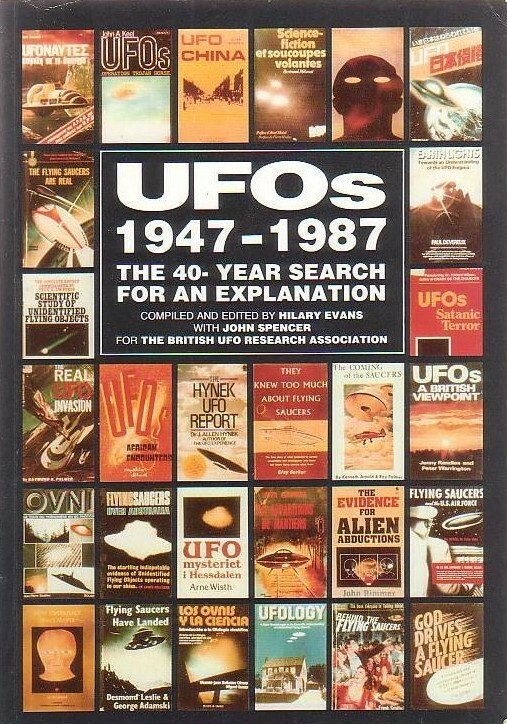 HB: Could you comment some on the state of ufology in Britain? HE: It´s terrible. I am not saying that arent´t some good investigators but most of the time they are concentrating on abductions. The only people in ufology now are people with some kind of emotional commitment. John Spenser I am not sure about. Basically he is a writer. He is writing books for money. I think he is honest. But at the same time he is not what I would call a true investigator. I´ve pulled away from the whole thing and so has Paul Fuller. We have no worthwhile investigating organization in Britain. I still have a great respect for Jenny Randles but now she is more or less independent. It could get better if we get a new generation. HB: What is your own worldview? HE: From the religious point of view I am an atheist. I think the case for a God is nonexistent. I hate religion. I hope I´m not offending you guys. I wouldn´t call myself a humanist. I´m not an ist of any kind. On the other hand I am convinced there are a great many things that should be … I´m certainly not a materialist. I do believe in the potential of the human mind. I am sure of the street lights effect If it is true that people can make a physical object like a light switch on and off by their mind then we are talking about something which science says is impossible. But we know the mind can influence things. I strongly belive in poltergeists for instance. HB: But you don´t believe in a spiritual world or other dimension as an explanation for these things? HE: I am sufficiently open minded not to close my mind to the possibility but I think for the time being we can still find explanations in our science. But I do think that the human mind is still unexplored territory. ”I don´t think I have ever seen so much UFO material in one place – and so well-organized as well.” Hilary Evans in the AFU Guest Book, October 7, 1996. 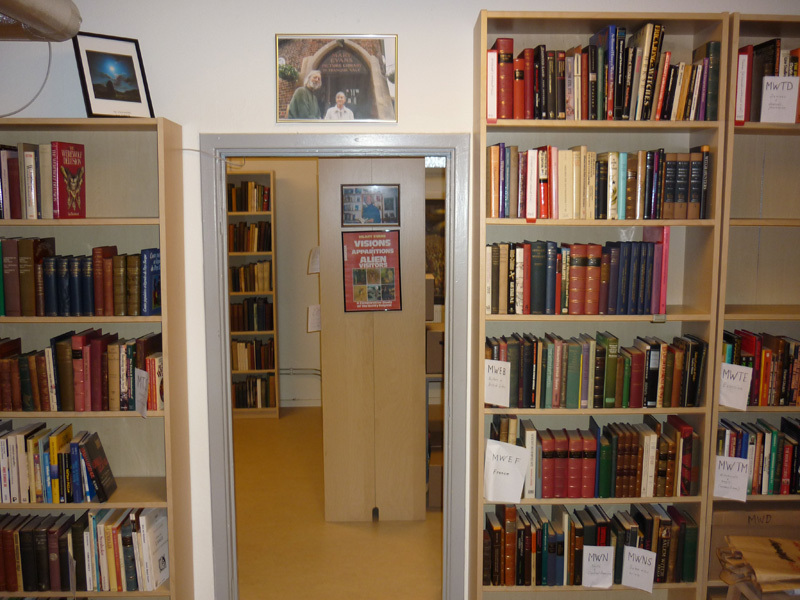 One of the most extensive collections of unique books and magazines ever donated to AFU arrived at our premises in Norrköping, Sweden on December 13, 2010. We were celebrating our annual festivity on Saint Lucy´s Day with coffee, mulled wine and gingerbread when a truckdriver from Schenker called and said he was waiting for us to unload some pallets. The AFU staff put on their Winter clothes and walked up to the lorry and were met with a sight the like we have never encountered before. 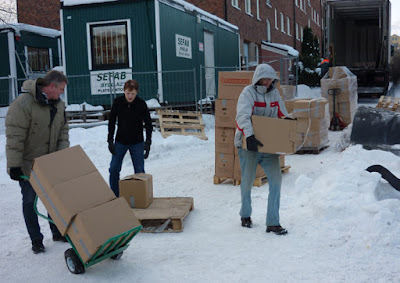 In the snow stood eleven pallets with 235 large and heavy boxes. Luckily we were ten AFU people who helped carrying these boxes. But it was a tough job in the snow and icy stairs down to our basement premises. The boxes contained more than 9.000 books and thousands of rare magazines from all over the world. This superb collection was donated by Hilary and Mary Evans from London. We are honoured och proud that AFU was chosen as the custodian of this immensely valuable collection, covering subjects like UFO, Forteana, folklore, parapsychology, paranormal phenomena, ancient mysteries, mysticism, Esoterica and a host of other subjects. Mary Evans died in 2010 and Hilary in 2011 but I hope that from their celestial spheres they are satisfied with our work to preserve this important heritage, now housed in the Evans Library at AFU. 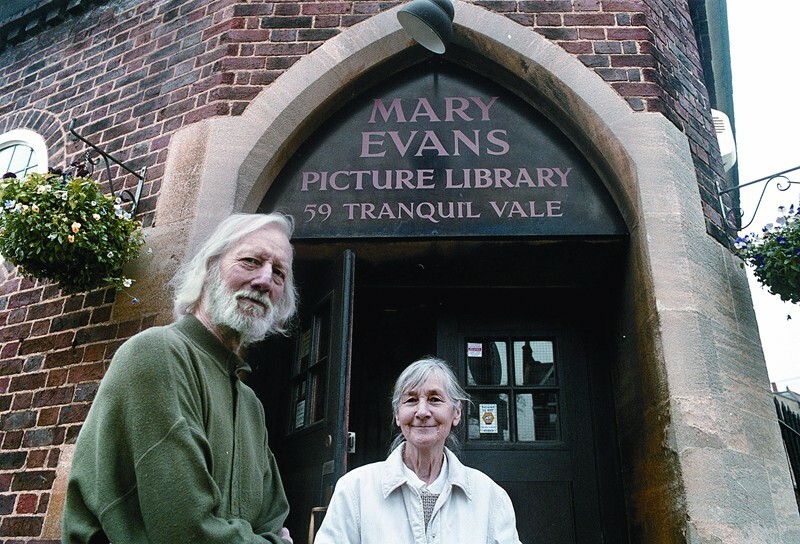 For a more detailed presentation of our work together with the Evans couple read AFU chairman Clas Svahn´s inspiring obituary written on the day of Hilary Evans´ death July 27, 2011. 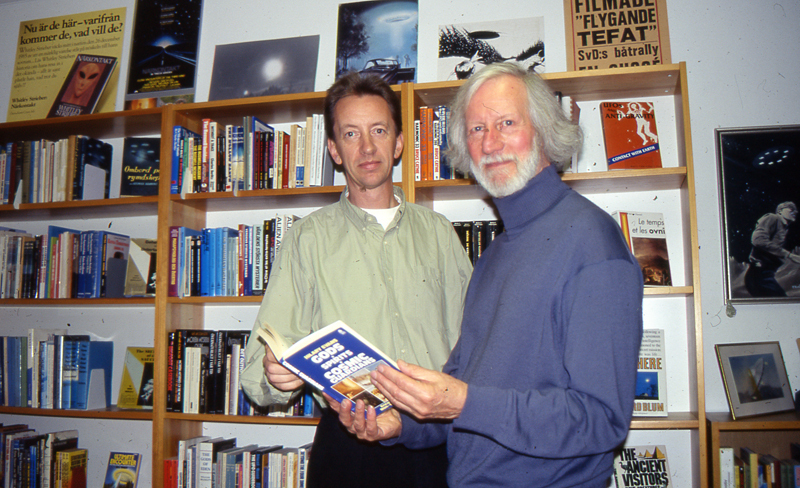 When Hilary Evans visited AFU on October 7, 1996 my colleague Anders Liljegren and I made an interview that was only published in UFO-Sweden´s magazine UFO-Aktuellt, no 3, 1997, and only in an abbreviated version. But so far this interview has never been published in English. I wish to share a transcription of the complete interview as today it is of historical interest. Hilary Evans was a skeptic regarding UFO phenomena, advocating the Psycho-Social Hypothesis, but he represented skepticism at its best, open-minded and positive towards all kinds of research. Håkan Blomqvist (HB): Could you start by telling something about yourself, your background, history? 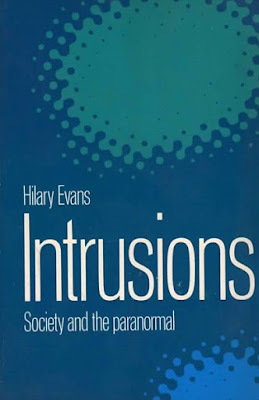 Hilary Evans (HE): Well, the most important thing about me from the point of view of ufology is that I am not really a ufologist. I come from a background of paranormal phenomena in general. I was a member of the council of the Society for Psychical Research and I resigned because I was to busy. Basically my interest is in all kinds of phenomena and it was only then I discovered that UFOs were a very special kind. The reason why they are special is that everybody are so interested in them and because of that there are many conferences, many publications. The witnesses to UFO phenomena are more accessible than witnesses to other kinds of phenomena such as ghosts, apparitions. It is not easy to find somebody who has seen the Virgin Mary, but I have in fact met a friend of mine who saw the Virgin Mary many times, but that was very unusual. But to find somebody who has been taken aboard an alien spacecraft is not difficult at all. They are only too happy to come and tell you about their experiences. HB: Ok, let´s go back again. When were you born, what year? HE: A very long time ago 1929. I see you want basic facts. HB: Yes, I´m very fact oriented. HE: Good, ok I was born on the 6th of March 1929. I went to Cambridge University where I studied Literature. I did my military service in the Palestine police and after the university I took a job in advertising, in publicity and others, my occupation for 15 years I suppose. Then we started the Picture Library at the same time as I was working in publicity. Little by little the Picture Library took over my house and now it´s my full time job. I still think of myself as a writer first and a librarian second. 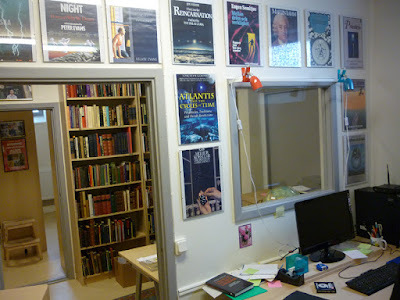 But in fact the librarian part of my life takes up 90 percent and that leaves me very little time for writing. I would like to make a change in that but I can´t. I don´t have the time. HB: What started your interest in the first place? HE: Oh, I can tell you that very easily. When I was, I suppose, fifteen or sixteen I was sent to take an examination in another town, to Cambridge. I went away from school to Cambridge and I had to stay in the college while I took the scholarship examination. It was the first time I had been on my own, a young boy, and they gave me some money to spend for my expenses. And I was the kind of boys if you had some money you spend it on books. Immediately I was given this money I went to one of the big bookshops in Cambridge and bought a lot of books. I bought books on all kinds of things, the history of education, history of the symphony. One of the books I bought was about the paranormal. HB: Do you remember what book it was? HE: Yes, it was the Personality of Man by G.N.M. Tyrrell. It was published by Penguin Books, a paperback. And for the first time I heard about this extraordinary world of anomalous events. My parents hadn´t told me about it, my teachers hadn´t told me about it. Nobody had told me about it, that there exists telepathy and ESP and psychic phenomena and things like that. HB: Nothing in the background? HE: You have to remember I am talking about a very long time ago. Today you see we all take these things for granted. I will tell you something that illustrates this very well. In this new book that I am proposing, that you are going to contribute to, Dennis is going to write the introduction and I am going to write the epilogue. He will present some kind of history of the phenomenon and I going to try to make sense of it from a sociological point of view. 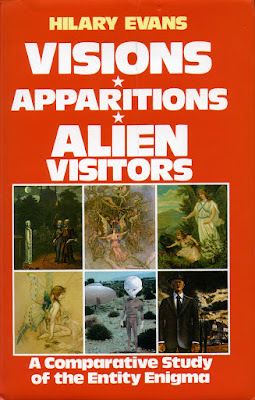 And I started thinking about this and it suddenly occurred to me that, one thing I will say is, most of the people who read this book will not be able to remember a time when there not was such thing as a flying saucer. You two are young enough. Probably you never remember a time when nobody had heard of flying saucers. But in fact there was such a time and it wasn´t all that long ago. It was fifty years, when these things were created in a sense in the imagination as a phenomenon you could write books about. HB: You started becoming interested in paranormal phenomena? HE: Yes I was interested in paranormal phenomena but most of the time I was to busy at work that I could take any active part. Then in the 1960s I suppose I said, now this is ridicolous if I wait until I have enough time I will waite forever because I will never have enough time. That is when I joined the SPR and started playing a more active part. I was very shy about involving myself becasue I thought I know nothing about it. Here are people who are scientists and doctors and psychologists. They know all these things. I don´t know anything. In the beginning I was very diffident. Until after a bit I realized that in fact they don´t know anything either. Anders Liljegren (AL): You haven´t experienced anything yourself? HE: No, but I´m convinced that things like precognition and telepathy occur. Because I´ve had a little examples of that myself. But I´ve never seen an apparition. I´ve seen things in the sky I can´t explain but I don´t think I´ve seen an extraterrestrial spacecraft. HB: You said you started being active in SPR and psychic research? HE: I was a member of that and I realized that flying saucers in all their various aspects presented a very special case of paranormal phenomena because they were accessible. HB: But you still regard them as paranormal phenomena? HE: Yes, in a sense, but my definition of paranormal is not supernatural. It´s many things we can´t explain. So its beyond normal. It´s something outside the consensus terms. But it doesn´t mean to say that it is a mystical explanation. I´m not a materialist either but I wouldn´t say that any of these things is outside science. I think that science will find a explanation for telepathy and (inaudible). I´m convinced they occur and am convinced scientists are being stupid. Take spontaneous combustion for instance. I am one hundred percent convinced that spontaneous combustion takes place in spite of what the Skeptical Enquirer or whatever is saying. Because I think the evidence is so strong. I think that science is very much at fault to deny such a things becuase it is a phenomenon that actually occurs, like the crop circles takes place, whether they are hoaxes or they are real is another matter. They occur and to deny that they occur is ridiculous. In the end of the 1970s there was announced a conference in Salzburg, I think it was 1979, organized by some Italian people. It was on the subject of encounters and abductions and I thought this really is interesting. You may laugh, but I very nervously wrote to the Italians who were organizing it saying I would be very interested to attend and hoped I could present some views of my own. At that point all I had been to was one or two congresses but just a member of the audiences listening. I was trying to make up my mind. I felt very flattered, he said yes we would be very glad to hear what you have to say. I went along and it wasn´t a big public thing, all by invitation just in a hotel outside Salzburg and I suppose there were a maximum of thirty people all sitting around a table. It wasn´t a hall with rows. It was more like a big conversation. Alwin Lawson was there and that was the beginning of my friendship with him and one or two people from France. I decided to go by car from England to Salzburg so I drove through France to meet some French ufologists. And that´s when I met with (inaudible), Jacques Scournaux, Claude Maugé and that crowd, all very skeptical. That was the time of the Cergy-Pontoise case and one of the people there was Michelle Piccin. He was investigating this case. It was very interesting what he had to say. So I met all these very interesting, very skeptical people and then I went to Salzburg and met people like Alwin Lawson whose theories are very interesting. He told us about the imagery abductee experiments that he had done. And I realized that there was in ufology a kind of a, not exactly a secret college, Invisible College, but something like that. There were a number of people like myself who were on the whole very skeptical, but at the same time who believed that there were some very genuine questions which needed to be answered. So I identified myself very much with this group of people and as a result it gradually extended to that I have friends and acquaintances, people I´ve never met but who I corresponded with over the years and gradually built up a sort network and I think it is the same for all of us. . We are not ufologists in the classic American sense but we form a kind of Invisible College of people who are not concerned with selling books or making money. We are concerned with establishing the truth. I don´t write books to make money. The amount of money I get is nothing. I like books in order to express myself so that people can read me and they can disagree with me or agree with me. 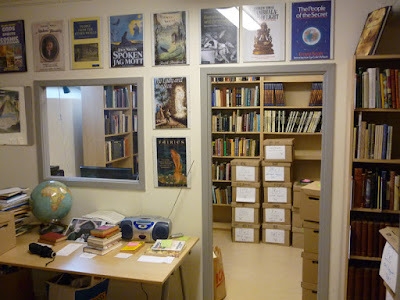 Much of my daily activity this last year has been reviewing and organizing the voluminous Borderland Sciences Research Foundation (BSRF) archive, donated to AFU in two large shipments in 2016 and 2018. 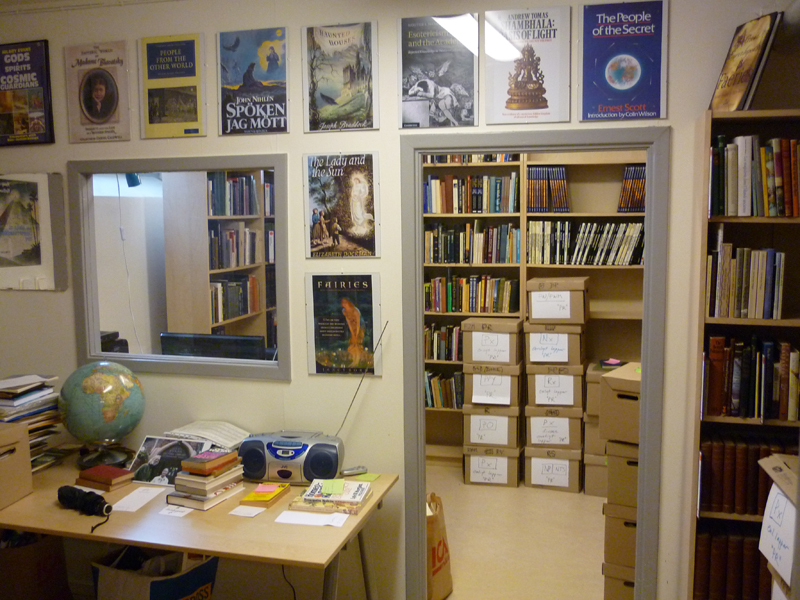 The major part of the archive has now been organized in alphabetical folders: name, organization, subject. I also try to scan as much as possible of various documents, letters and photographs. As I corresponded with Riley Crabb 1979-1985 the archive relating to his work has been first priority. He was director of BSRF from 1959 until 1985 and his correspondence file is very extensive. 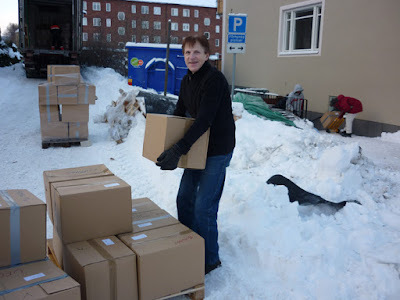 In an earlier blog post this year I made a brief study of the letters my AFU colleague Anders Liljegren and I had found in the boxes. But this proved to be only part of the collection. Recently Anders discovered serveral old folders with letters from the 1950s and 60s. I have now scanned the complete Riley Crabb correspondence file comprising of no less than 943 letters written between 1952-1993. This collection gives a unique insight into the personal life of esotericist and ufologist Riley Crabb but also the inside story of the pioneering work of Borderland Sciences Research Foundation. It is obvious though that the correspondence that has been preserved is only a fraction of the original collection. This becomes evident when comparing the amount of letters from different years. There are 214 letters in the 1958 folder but only 21 in the 1964 folder. Reference is often given to letters missing and my own correspondence is not to be found. Perhaps some of the missing letters was kept in the personal Riley Crabb archive which his third wife Phyllis Hall consigned to the municipal dump after his death in 1994? To give some glimpses of the life, ideas and work of Riley Crabb I have chosen to comment on a few excerpts from various letters. This first study comprise quotes from letters written 1953-1958. One of Riley´s lifelong interests was the Shakespeare-Bacon controversy, the question of who actually wrote the Shakespeare plays? In 1953, during his Hawaii years, he wrote a very critical letter to the editor of the Honolulu Advertiser: ”In vain have I searched two recent columns on your editorial pages on the Shakepeare-Bacon heresy for any solid rebuttal to my forthright statement that Francis Bacon wrote the plays which carry the by-line William Shakespeare… A lawyer wrote the plays. Bacon was a lawyer. A poet wrote the plays. Bacon was a poet. A philosopher wrote the plays. Bacon was a philosopher. An educated man with a working vocabulary of over 15,000 words wrote the plays. Bacon, by the standars of his day, was one of the best educated men in England. But the actor, William Shakespeare, had none of the above qualifications; and if your editorialist, along with all other academic troglodytes, insists the the illiterate money-lender did write the plays, he is placing himself in an indefensible position.” (Letter to the Honolulu Advertiser, March 9, 1953). The Shakespeare-Bacon controversy was one of the first problems in esotericism that occupied the young Riley. Later he would become a member of the The Francis Bacon Society in London and wrote the booklet Young Francis Bacon. He also lectured on this subject and continued research all his life as indicated by a letter to the Minneapolis Public Library 1958: ”A former fellow-worker of yours, Mrs. Irene Buckley, librarian at the Marine Corps Supply Center here has suggested that I take one of my reference problems to you, seeing that it was reading material from the shelves of the Main Library which got me interested in one of my favourite studies, the Bacon-Shakespeare controversy. It is possible that he book or books whose title and author I hope you can find for me are long gone from the shelves, as my studies of Elizabeth and her times occurred in 1937 and 1938.” (Letter to Miss Martina Brown, Minneapolis Public Library, May 3, 1958). 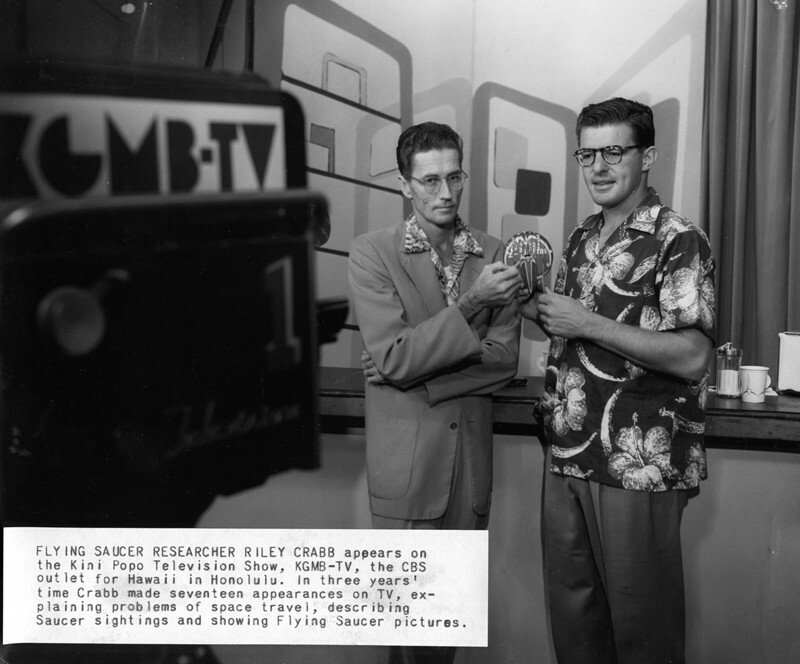 In August 1957 Riley Crabb and his wife Judy left Hawaii and settled in California. 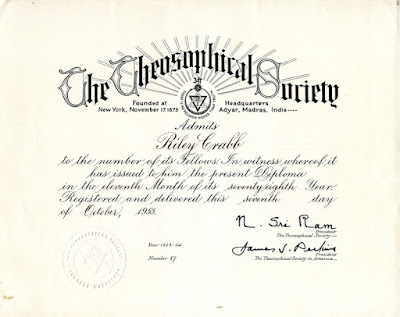 This meant new job opportunities, new aquaintances and another direction in Riley´s research and study of UFOs and esotericism: ”So here Mrs. Crabb and I are on the mainland, me with questions in my mind to which I hope to find answers here in the peace and quite of the desert. One of these questions is whether I should try to give active leadership in theosophy again. Fortunately that doesn´t have to be answered here and now. By the time I´ve evaluated the work of the past three years in the Islands, and built a new base of the ashes of the remains, I´ll probably know.” (Letter to Harold and Dorothe Ross, November 18, 1957). During the Hawaii years Riley had been President of the Honolulu Lodge of the Theosophical Society 1954-1957 and founder of the UFO research society Akualele Research Group in 1956. But he was not happy with Theosophical lodge work and questioned the activity in a letter to his friend Harold Ross: ”I had a chance to get my hands on a copy of the Mahatma Letters while in San Diego and what a revelation on lodge work. About the London Lodge, Koot Hoomi said then it would eventually fall into `quietism´. A fate that threatens every religious and philosophical group once its revolutionary leader is gone. When I consider the collection of conservative fuddy duddys and metaphysical dabblers I had to work with in Honolulu, after three years of being a lodge president, I wonder if it is worthwhile to become active again.” (Letter to Harold Ross, October 18, 1957). 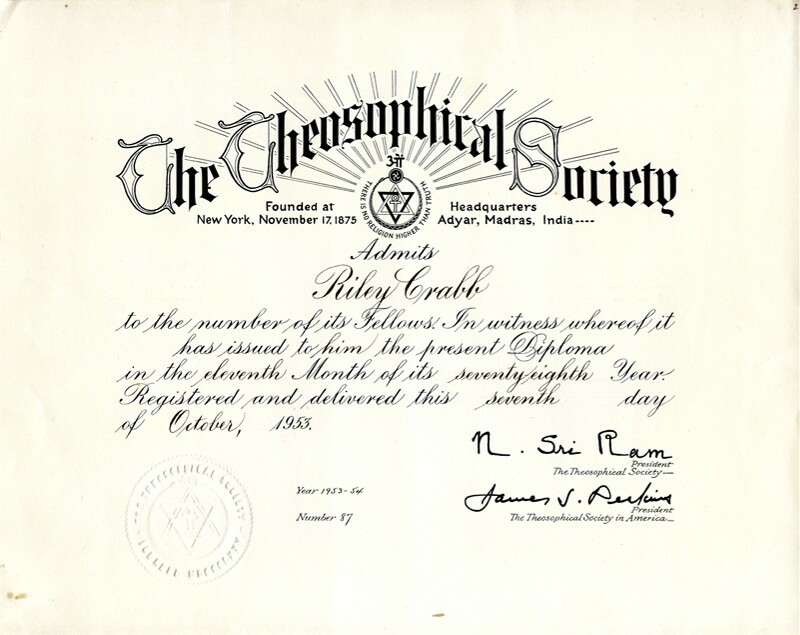 Riley Crabb was looking for a new and more up to date way to present the esoteric tradition. He was too much of the critical researcher and practical idealist to stay in the old type of theosophical lodge work. In California a new door opened in connection with a new cultural phenomenon - the UFO contact movement. 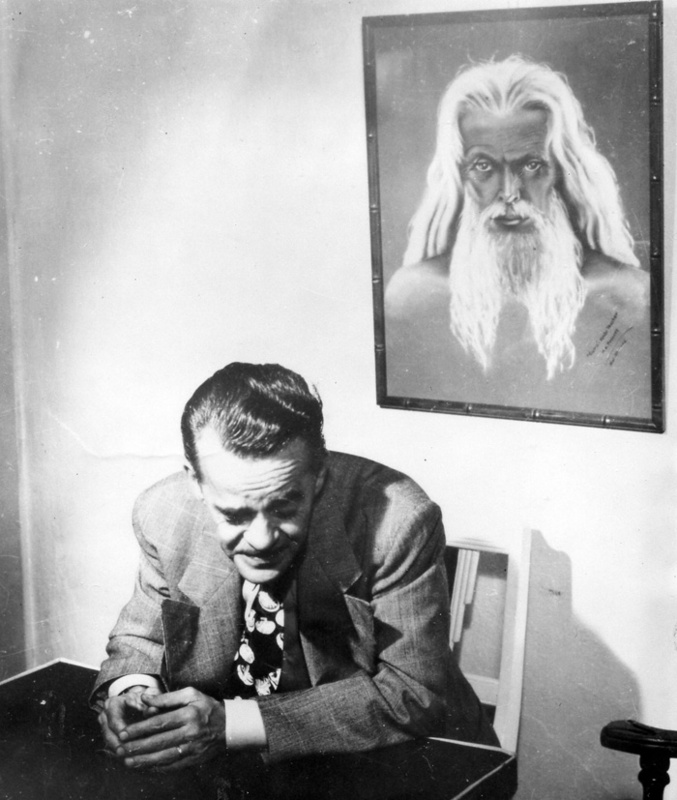 Riley described the California situation to Gray Barker: ”Outside brief visits with Dan Fry, George Adamski and George Van Tassel – whose Giant Rock home is only 60 miles from me – I´ve done very little about Saucers up until now. However, several of the Saucer groups in the Bay area have asked for some talks next weekend. So, it´s a TV appearance and lecture in Sacramento Friday night, San Francisco Saturday afternoon, Oakland Saturday night, and San Jose Sunday afternoon. Sounds like a rat race but I believe Judy and I will enjoy the trip. These California enthusiasts seem hungry for the metaphysical side of the saucer phenomenon and that´s what they´ll get.” (Letter to Gray Barker, Mrch 8, 1958). As an accomplished and well-informed esotericist Riley Crabb also noted the problems with the new UFO contact movement. Discernment and critical analysis wasn´t exactly the hall mark of the members of this underground movement. Riley had become a member of Borderland Sciences Research Foundation already in 1951 and he described the problem to Meade Layne: ” ”If I attend Van Tassel´s Space Convention May 31st and he invites me to get up and say a few words, I think I´ll repeat pretty much what´s in the Committee letter. At least it´ll be a down-to-earth contrast to the flumduddery and the psychic racketeers that flock there. Even Van Tassel is getting fed up with them; only he calls them `fanatics´. Says he´s going to try to control them this year, but he hasn´t said how.” (Letter to Meade Layne, April 26, 1958). In spite of the psychic racketeers and naive mystics among the UFO contactees Riley realized that behind this new movement was also a real attempt by ”superior beings” who tried to inspire a worldwide movement of goodwill and peace. Daniel Fry´s organization Understanding is a good example. As to who were behind this project Riley may have noted the information coming from the Inner Circle through deep trance medium Mark Probert: ”There is a certain secret work going on at present between the Etherians and certain high earth authorities (You understand, I suppose, that I do not use the word ”high” in the usual sense. I am referring to those belonging to some of the secret Lodges on Earth).” (Seance Memoranda From the Inner Circle, Novembner 28, 1951, p. 30). Riley Crabb expressed this idea in a letter to Fred Church: ”… the number of Flying Saucer research groups burgeoning forth here in Southern California is amazing. The demand for lecturers is constant… It is actually building up into a world-wide fellowship, loosely organized if at all, but with a common interest in outer space and the arrival of superior beings from elsewhere, interested in our welfare. These widely scattered groups may eventually blend with the New Group of World Servers. This latter movement seems to have been stimulated by Alice Bailey and the Master who is her Teacher. The effort now is for a world-wide fellowship, at the mental level, of men and women of good will everywhere. If there is any hope for our civilization and the planet I believe this is it.” (Letter to Fred Church, November 24, 1958). 1959 would prove to be a decisive year for Riley Crabb. Meade Layne´s health was declining and he asked Riley to become the new director of Borderland Sciences Researh Foundation including editor of Round Robin. The Journal of Borderland Research. How this new life was reflected in the correspondence I will present in a later blog post.